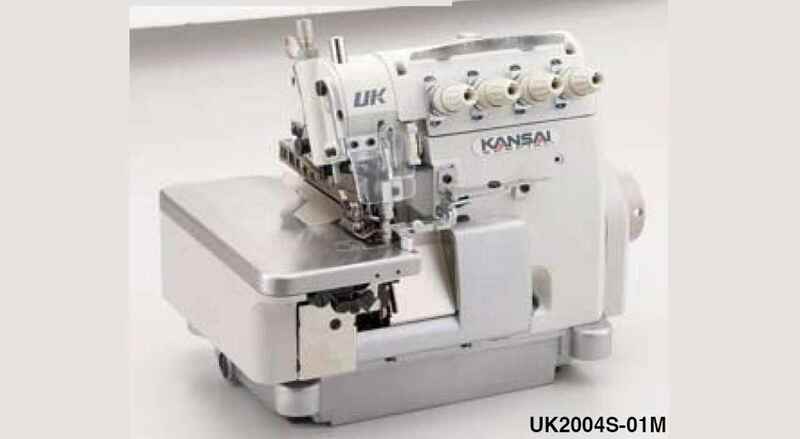 "Kansai Special's new overlock machines "
The new UK series is a 1to3 needle, overlock and safety stitch machine. 1 needle, overlock machine for brand hemming mainly, suitable for a T-shirt, underwear, and etc. 2 needle, safety stitch machine for attaching tape suitable for sewing light to mid heavy weight material such as a T-shirt, knit wear, and etc. 2 needle, safety stitch machine for shirring suitable for sewing light to mid heavy weight material such as a curtain, apron, and etc. 2 needle, safety stitch machine piping suitable for attaching piping cord of the edge of curtains, cushions, bed cover, etc. 2 needle, safety stitch machine for extra heavy materials. 1 needle overlock machine for work glove(wrist part). This new UK series contains a number of novelty features and benefits. Machine makes your work neat and clean.